From the Dottie Rambo Elvis Presley Collection. 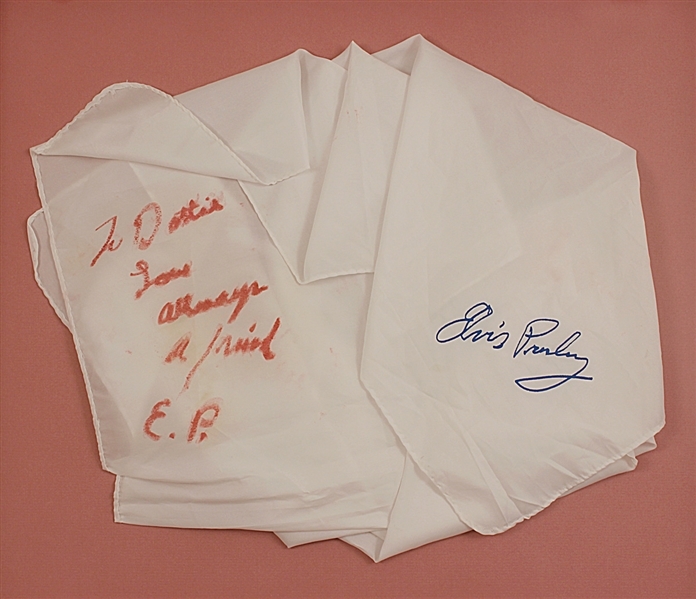 Elvis Presley gave this signed and inscribed stage worn white scarf one night after his show in Las Vegas. Elvis has written, "To Dottie, Love Always, a friend. E.P." in red lipstick. Dottie and Elvis were very good friends, and Elvis recorded some of her songs. During Elvis's Vegas residency, Dottie frequently sat at the stage side with her daughter Reba during his show. During one such show, instead of giving his sweaty scarf to an overly eager fan, he ran to the side of the stage, grabbed Dottie's lipstick and signed it. Dottie kept this white scarf in a secure location, close by her, for the rest of her life. Very good condition. Comes with a letter of provenance from Dottie's family and a Gotta Have Rock & Roll™ Certificate of Authenticity.